Send information regarding worship services to courier@pcnr.com. Please put “WORSHIP” in the subject line. SKIP PEARLMAN Brewster’s Jorge Lopez (9) and Carmel’s Steve Mazzoni (18) battle for possession last Thursday at Carmel. BREWSTER—The Brewster and Carmel High boys soccer teams fought to a 2-2 tie in a League 1-B game played last Thu… Please login below or purchase a subscription to the Putnam County Courier to access this content. SKIP PEARLMAN Ariana Bottalico of Brewster won the girls Varsity 2 race. BREWSTER—The Brewster High boys and girls cross country teams both turned in standout performances Saturday, as the Bears dominated the competition at the Bear Classic, w… Please login below or purchase a subscription to the Putnam County Courier to access this content. MAHOPAC—The Mahopac High boys soccer team kept the intensity up last week, and picked up two more wins. The Indians shut out Panas, 4-0, Saturday in a League 1-B matchup on the road, and Mahopac topped Yorktown, 3-1, two days earlier at home. … Please login below or purchase a subscription to the Putnam County Courier to access this content. SKIP PEARLMAN Brewster’s Tyler Hanson (21) picks up yardage Saturday at Poughkeepsie. 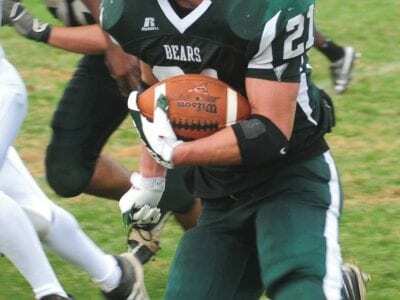 BREWSTER—Whatever could go wrong did go wrong for Brewster Saturday, as the Bears dropped a 46-0 decision to Poughkeepsie in a League A-North game playe… Please login below or purchase a subscription to the Putnam County Courier to access this content. Left: John Warden (24) of Putnam Val ley scampers for yardage in loss to Albertus magnus last week. Photo by SKIP PEARLMAN. PUTNAM VALLEY­— The Putnam Valley high football team lost a nonleague game at home to Albertus Magnus Friday night b… Please login below or purchase a subscription to the Putnam County Courier to access this content. BREWSTER – The Brewster High field hockey team placed third at its own tournament last weekend. The Bears tied Dover, 0-0, in round one, then lost in strokes, and then ended in a 1-1 tie against Pawling in the consolation round, winning in str… Please login below or purchase a subscription to the Putnam County Courier to access this content. CARMEL – A 22-yard field goal by Dylan Lovett turned out to be the difference Saturday, as the Carmel High football team handed Arlington its first defeat of the season, 16-13, in a League AA-North game at Carmel. Lovett’s boot actuall… Please login below or purchase a subscription to the Putnam County Courier to access this content. MAHOPAC – Frank Langella’s fouryard touchdown run gave the Mahopac High football team a 25-21 victory over John Jay CR in a League AANorth game played last Saturday in Cross River. John Jay (1-3) had taken a 21-18 lead in the second qu… Please login below or purchase a subscription to the Putnam County Courier to access this content.